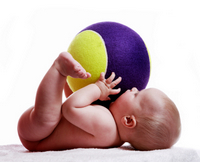 Infant brain development, check out what normal development should look like. As a child care professional, you'll want to learn what you can on infant brain development and other stages of infant development so you can provide the best care for the child. Having an infant in your daycare home can be such a rewarding experience; not only for you, but for the other children in your home too! (My daycare kids LOVE the babies- they love to help me care for them like a family member). If you want more general information on Child Development, click here to go to that page. In just the first year infants grow so quickly. Usually, by the their first birthday, they will have tripled their birth weight and will be crawling all over your home, or possibly even walking! They have so many amazing accomplishments at this stage. They need someone to provide them a warm, responsive and dependable environment...You! They need you to spend as much time as you can playing, holding, cuddling, rocking, talking, etc. to them and responding to their needs. You will absolutely love how they will respond to you. Nothing is more beautiful than when a newborn smiles at you!!! All the while that you are responding to them, you are helping promote infant brain development, and building their trust. Let's talk about infant Brain- Cognitive- Intellectual development, for newborns to one year of age. - They will explore (or "taste") objects with their mouths. It is amazing how fast they learn to do this! They will even want to taste you! - They will recognize their bottle. I care for a 6 month old who starts screaming when she sees hers- you can't get it in her mouth fast enough!!!. If breast fed - same thing! - They will react to and will look for different familiar sounds- like mommy's or your voice, a musical toy, or rattle, etc. - They will play with their fingers, hands or their toes. They will also grasp your finger in their tiny hand. - They will turn their heads toward lights or brighter colors or objects. - They will focus their eyes on small objects and try to reach for them. - They will explore an object by chewing on it, banging it, shaking it, or simply by touching it. - They will love playing the "drop the toys" game- usually from over the edge of a crib, high chair, your lap, or bouncy seat. - They will make noises to show they are happy or not! - They will say their first word. - They will love to bounce or dance to music, and possibly attempt to "sing". - They will watch you and whoever as you hold a conversation. They are listening! - They will wave bye-bye or clap if you ask them to. - They will become interested in picture books. I have lots of board books for them to look at, and yes, chew on. - They like to put stuff inside of other stuff, or stack things. These are a few examples of infant brain development. There are other stages of infant development. Next we'll talk about Infant Social Development, . which is also referred to as social and emotional development. Go to the top of Infant Brain Development. More general information on child development, click here to see my Child Development page.